Everyone is creative and the Studios of Cocoa Beach, 165 Minuteman Causeway in downtown Cocoa Beach offers Sip n’ Paint Parties for adults and families. Local artist and experienced teacher Jaymee Weinreich will guide you through a complete acrylic painting from 6 to 9 pm on Friday, August 10, 2018. 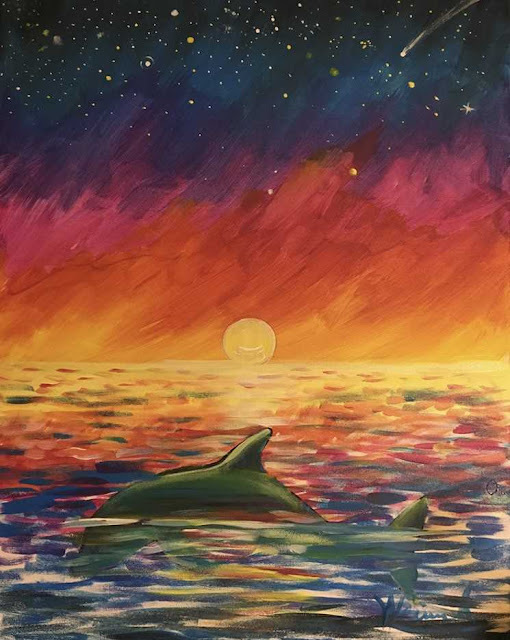 Bring your friends and your favorite beverage and go home with a complete work of art: a colorful seashore painting “Dolphin at Dusk”. No previous experience is necessary. We’ll supply paint and canvas, you bring snacks and drinks and prepare for a fun experience. $35 includes all materials. Registration is required. Contact Jaymee at jaymeeweinreich@gmail.com or 787-640-6119 (text or call).